"If some is good, and more is better, than too much is just enough!" Cubic inches, camshaft lift and duration, and valve sizes, right? Well, not exactly. What? Bigger isn't better? Humm... Not always. Example: Ford's 1969 & 1970 BOSS 302. It was a great race motor and they won the manufacturers' championship in SCCA's Trams Am division in 1970 with it. The race motor was designed to make horsepower in the upper RPM range and was rated at 470 HP @ 9,000 RPM The street version was not as radical, but the huge valves and ports made the motor a 'dog' below 4,000 RPM. Around town it wasn't tractable. Rare example? Maybe, but it does prove you can run ports and valves that are too big for street use. In fact the Ford boys who swap Cleveland style heads onto their 302's now have the option of special head gaskets with smaller openings and plates that go down into the intake port that effectively narrows the port reducing the port volume for more efficient flow in a streetable package. "But I want bigger valves! Mine are too small!" 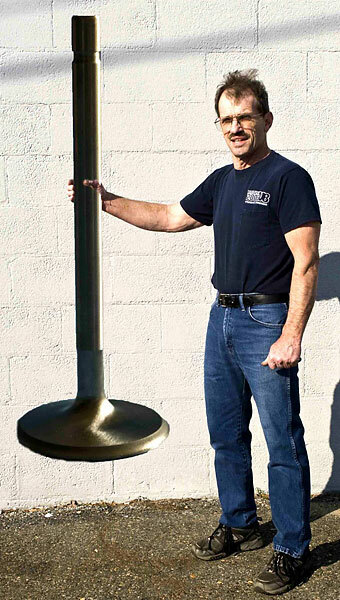 OK, larger valves can help performance and if done right, volumetric efficiency... which helps everything. HP and mileage can both gain from this modification. Even with everything else the same, intake manifold, carburetor (or fuel-injection), cam specs - larger valves make it easier for the engine to breathe. That would require less throttle opening at highway speeds or it can take in more air/fuel mixture at wide open throttle. What's needed? Bigger valves and a machinist to open up the seats, right? Well, that's a start but more is needed. If that was all you did and left the throat (i.e. the area between the bowl and the valve) the same, you'd create turbulence and possibly reduce the overall flow as there is now a larger obstruction in the airflow's path. To realize any advantage with larger valves this area must be opened up. This is quite a common operation in most machine shops. Many valve seat machines have an optional "Bowl Hog" tool that does just that. Often times someone will want their "2 barrel" heads opened up to the "4 barrel" size. For example a small block Chevy with 1.94 inch intake and 1.5 exhaust valves can be easily upgraded to 2.02 inch intakes and 1.6 exhausts. These larger valves are readily available at affordable prices. Undercut and swirl polished valve stems (left) provide a performance advantage. Readily available stainless steel valves will be just fine for a high performance street motor. Want just a little more? 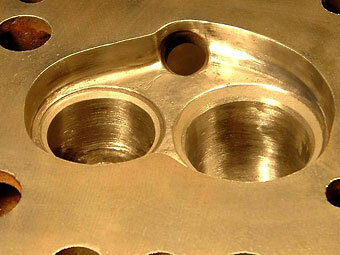 Opt for valves that are undercut and swirl polished. Having a stem that is undercut at the lower portion of the stem, where it protrudes into the port, allows a little more air to flow past. The swirl polish of this area and the back side of the valve has been shown to be of benefit too. In these two photos you can see where the small original exhaust valve has worn away the seat. It's the area inside the newly cut seat for GT40 valves. 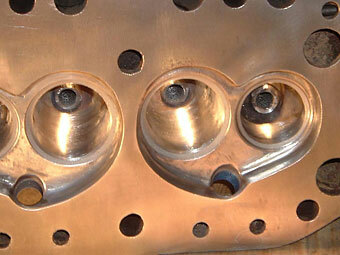 These heads, 1969 Ford 302 DOOE with 1.45 inch exhaust valves could not be rebuilt without new seats or larger valves. The newly cut seat needs to have the old seat / throat area opened up so that the flow potential can be utilized. First, the seats are roughed in with a 45 degree stone. 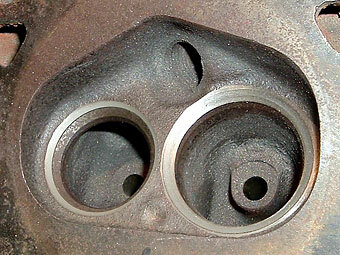 This is done as wide as the valve head itself. Measuring is important. Hand lapping the valve face with compound can also give you an easy read as to how things are mating up. After this step, be careful to keep your valves matched to specific seats. (I number them.) Once the seat is established, the 30 degree top cut can be made. After which a 60 degree throat cut is done. This aids the air to make the transition of turning to enter the chamber past the seat area. Some head machines make 3 cuts at once, but with my old trusty Black & Decker grinder I can only do one at a time. I need to be careful not to go too far, so I check several times. Quite often I see used titanium valves available on eBay for a ridiculously cheap price. 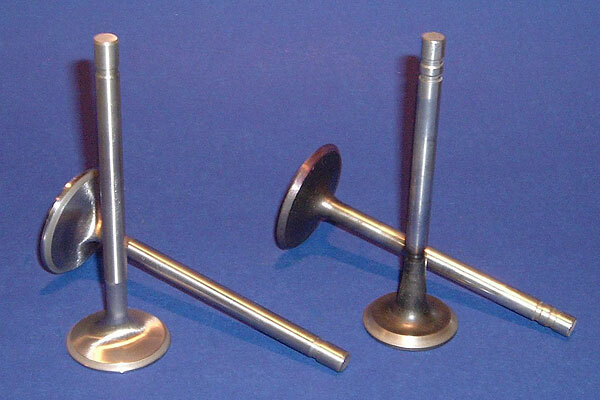 These are used race valves. They may have plenty of life left for a street motor. Very tempting when new ones can run $100.00 each. NASCAR boys use them with good reason. They're light, and thus they put less stress on the springs at the 8,000+ rpm they run for hours at a time. They're very strong, which is very important to these guys. 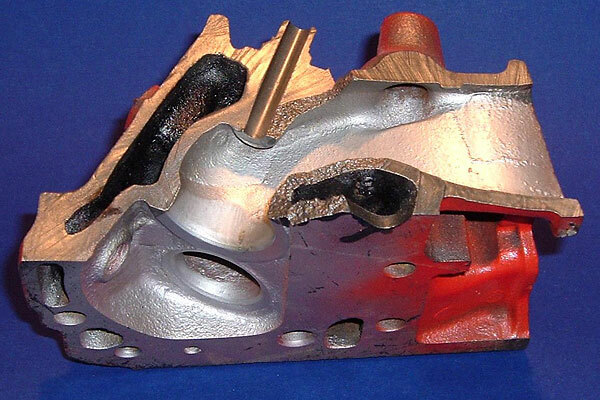 A valve failure at 8,000 rpm has catastrophic results for your motor, car and a long string of cars behind you. (The fact that the whole valve train lasts 500 miles at 8,000 RPM impresses me more than anything else about these cars.) So, what's wrong? They aren't standard! The valve stem will be longer, requiring a different spring set-up and longer pushrods to start with. Setting up the proper geometry afterwards can be tricky. Also they usually have smaller diameter stems, thus requiring your guides to be drilled or pressed out, new ones pressed in and then reamed to the appropriate size. 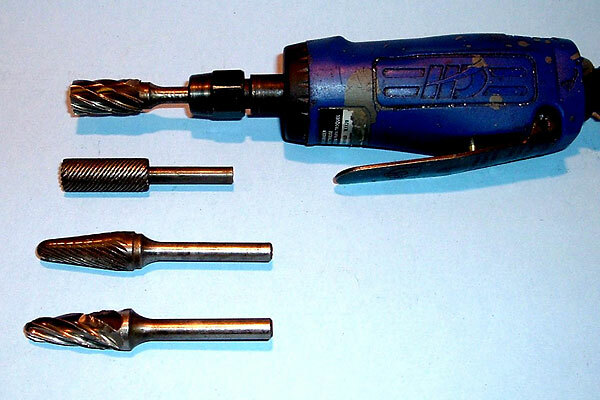 Titanium also requires different tooling on many machines, as it is very hard. Titanium valves may also require different seats pressed into your heads because titanium doesn't transfer heat very well. Beryllium/copper alloy valve seats are favored in race motors with titanium valves, but they're expensive because beryllium is a rare metallic element. (It's lighter than any other metal, it has a high melting point, and it's very strong, stiff and hard.) In a street motor environment, cast iron seats have been tried and usually have been found to work okay with titanium valves. When MG had to add the larger bumpers to the "B" in 1972 and increase the ride height to conform to Federal bumper height requirements, the whole car weighed more. 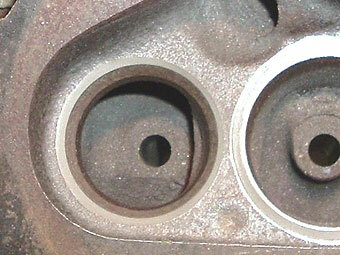 One little thing they did to regain some performance was enlarge the exhaust valve and bowl area. These larger valves can be installed in earlier heads for better breathing. That's what we see in the next picture. The stock MGB ("B-series") cylinder head can be opened up for better airflow too! In the second picture, the close-up shows how far the bowl was opened up to make the transition to the larger diameter seat easier for the air/fuel mixture. Notice also that the intake bowl was opened-up even though the valve size remained the same. This is a critical area in most wedge type heads. Look again at the way the port narrows as it approaches the seat in the cutaway picture above. Can you do some of this in your home workshop? The answer is a definite maybe. You'll need a variety of tools. First, to access the area you'll need a valve spring compressor. Not all compressors work on all heads. Check that the one you buy fits your application. Next, if the machine shop did a decent job with the seats, you'll need a die grinder (electric or pneumatic) and carbide points, mounted grinding stones and sanding rolls with mandrels for finishing. If you use a pneumatic die grinder, you'll need a large capacity air compressor! (These things use a lot of air.) A less expensive air die grinder can work just fine for the home enthusiast. I have several so I don't need to change the bits, leaving a stone in one, carbide bit in another and a mandrel for sanding rolls in a third. The reason for this is that it's the chucks on these grinders that wear out. 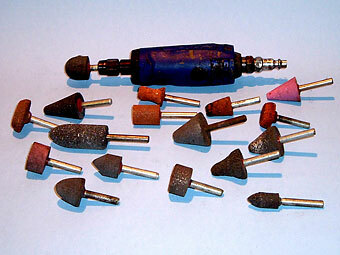 A pneumatic die grinder and carbide cutting points. 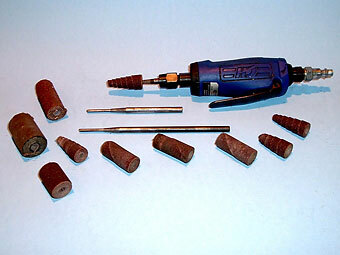 A pneumatic die grinder and abrasive cutting tools: grinding stones (at left) and sanding rolls (at right). If you're brave enough to try it, go slowly. The carbide bits cut well and the mounted grinding stones are very useful, but wear down quickly. Start with a larger diameter stone. It contacts a wider area and won't cut in deep as quickly - helping you to avoid mistakes. Grind down into the throat to blend the transitional area. Finish the area adjacent to the lower 60 degree cut with a large diameter sanding roll. Be careful! If you touch the finished seat, you'll need to take the head back to the machine shop to have it touched up. (Hint: it might be best to finish both heads before returning!) Don't cut into the seat areas, or the valve will have nothing to contact and seal to, and you'll need the whole seat area cut out and a new seat pressed-in. This work will help almost any head. As cast and machined from the factory, most heads leave plenty of leeway for machine misalignment, etc. We can improve on that. I have installed larger valves for many friends by using this approach, and they've all come back with positive reports. More power, and even improved fuel mileage in cases where that was a concern... The way things are going, it'll be a big concern now and for the foreseeable future. Disclaimer: This page was researched and written by Greg Myer. Views expressed are those of the author, and are provided without warrantee or guarantee. Apply at your own risk. Photos by Greg Myer for British V8 Magazine. All rights reserved.